click photo to enlarge OK OK... friends and family back home in Cleveland have been looking for pictures of my trip home. So, enough other pictures for now.<grin> I'm always a few weeks behind in what gets posted. 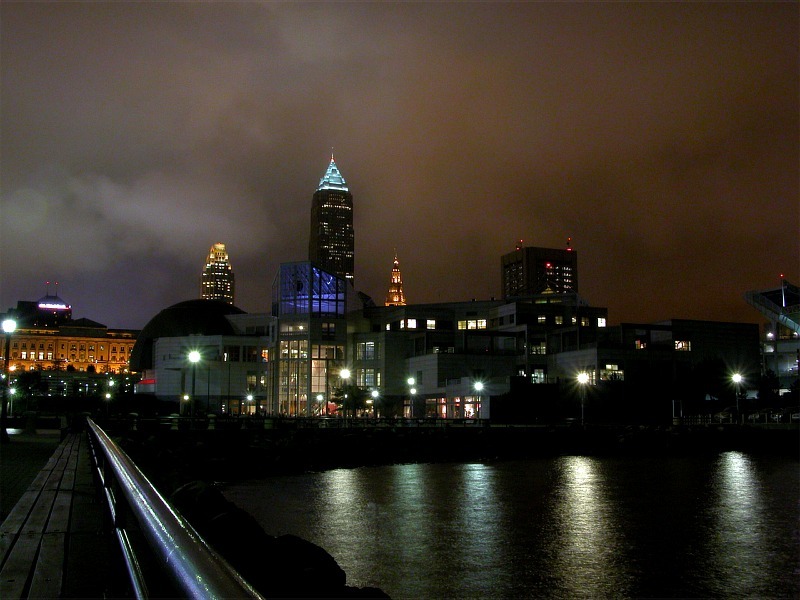 There are only night pictures because, in typical Cleveland weather, I didn't get any pretty days to take photographs in downtown Cleveland. 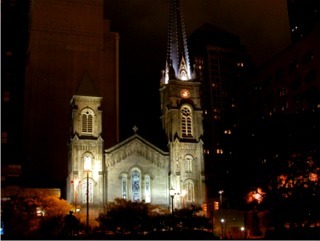 So, I decided to go downtown and shoot night photos; then it doesn't matter if it's cloudy or not. 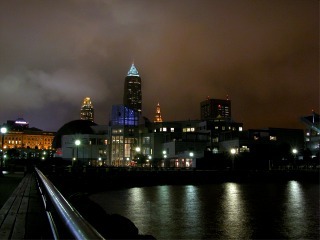 This is the Cleveland skyline with the Science Center in the foreground and some of the more notable buildings like the Terminal Tower and BP buildings in the background. click photo to enlarge This is one of the new buildings that Cleveland is famous for. The Rock and Roll Hall of Fame Museum. But shhhh.... they copyrighted the building and you're not allowed to take pictures of it. The lights to illuminate the outside of the building were not on when we first got there. When it got darker, the lights came on, however, this picture turned out better then the one where they were on. 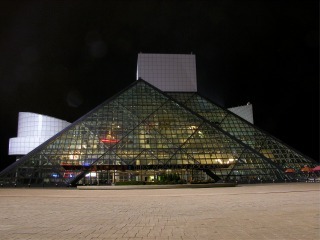 click photo to enlarge shhhh this is another picture of the Rock Hall. I.M. Pei designed the building and they have great displays and exhibits inside. Karen and I were there on opening day when they dedicated the building. The only Rock Star we saw was Lou Reed. We watched the concert from home and it was fabulous. 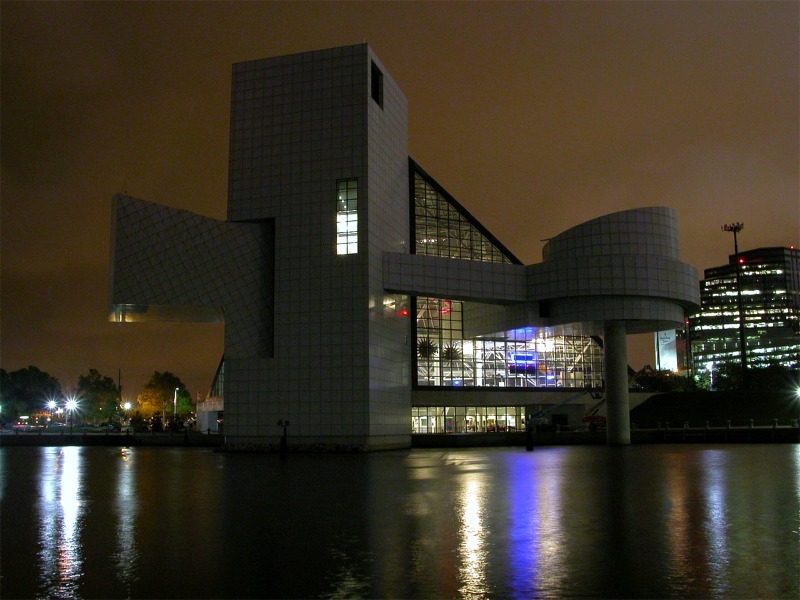 click photo to enlarge Another thing Cleveland is known for is its bridges. There all all kinds of bridges still in use today, lift bridges, swing bridges and rotating bridges. 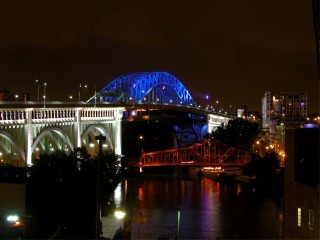 The larger bridge in this picture is the Detroit-Superior Bridge commonly called the High Level Bridge. It was built in 1918. The upper deck carries automobile traffic and the lower level carried street cars. The one below it is the Center Street Bridge. Both these bridges were built by the King Bridge Company. click photo to enlarge This is the Old Stone Church on Public Square in downtown Cleveland where Karen and I were married. This building was built in 1885, and suffered its first fire in March, 1857. It was restored and went through a second fire in January, 1884. It was again restored and is essentially what is standing today. The building has a lot of history. A front row pew is roped off because it is where Lincoln's family sat when his funeral train came through Cleveland. Inside the church are 4 Louis Comfort Tiffany stained glass windows and a magnificent Pipe Organ built by the Cleveland Holtkamp Organ Company.